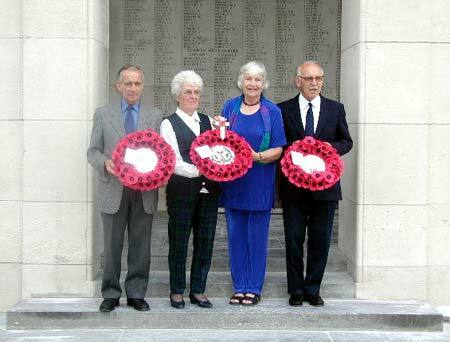 At 8pm on 19th June 2002, the 87th anniversary of their uncles death a mile and a half away near Hooge, nephews and nieces of Pat Gordon were given a central role in the nightly ceremony at The Menin Gate by the Last Post Committee at Ypres. A friend of the author of this site who lives in Ypres, Jacky Platteeuw, met the seven members of the family by the ancient Cloth Hall and accompanied them to the Memorial where they laid three wreaths following the sounding of The Last Post and reading out of their uncle's name and details. 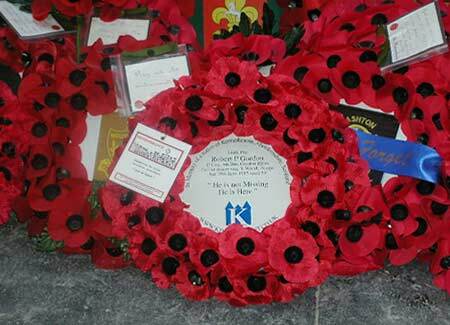 Two Flanders Poppy wreaths were taken from Kennethmont and laid by the Gordons on behalf of this website and Tap O' Noth Community Council. The third tribute was from the Gordon Families. A crowd of between 250 and 300 locals, visitors and pilgrims had gathered unaware that family members of the soldier to be commemorated were present and witnessed the proceedings. 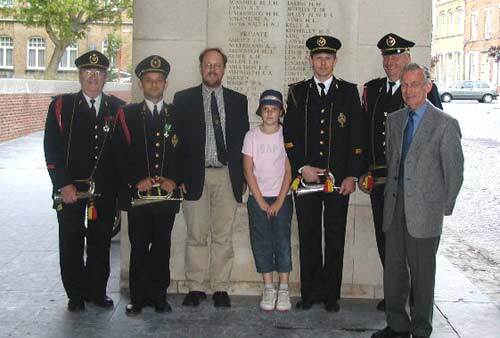 The Gordons later met, thanked and had photographs taken with the buglers from Ypres Fire Brigade. The firemen felt particularly honoured to carry out their nightly duty in conjuction with the fallen soldier's family. Four buglers in full dress uniform, including senior bugler Antoon Verschoot with 48 years service, were present instead of the more usual two man bugle party. 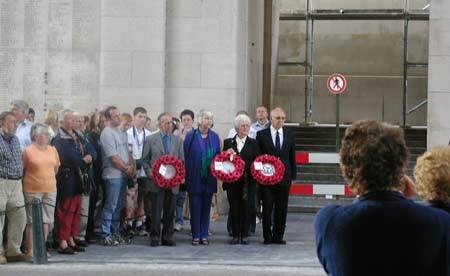 The family hear Last Post echo through the memorial archway of The Menin Gate. The family walk across the Menin Road to lay the tributes. 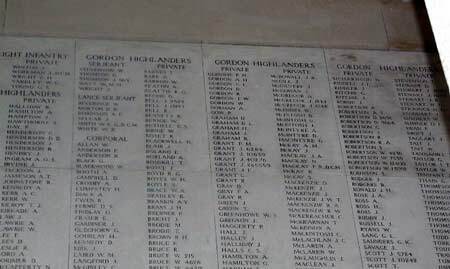 The Gordons with panels bearing the names of missing Gordon Highlanders behind them. 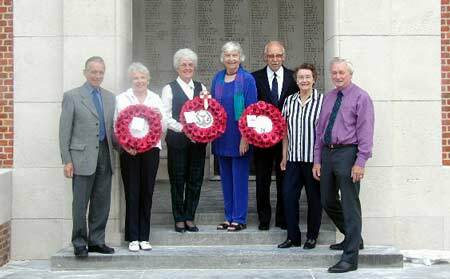 The seven members of the party who travelled to Ypres to witness the ceremony. 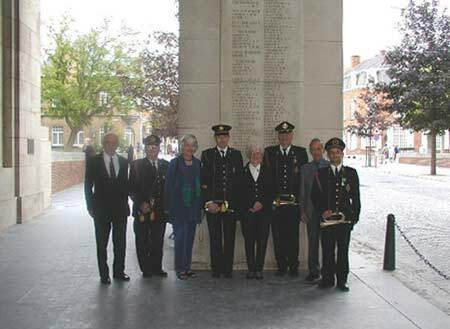 The Menin Gate Bugle Party is formed by past and present members of Ypres Fire Brigade. Raf Decombel - bugler, Michel Ghesquière - bugler, Robert Gordon. Every day for a year - from 1 November 2001 to 31 October 2002 - the Last Post Ceremony will draw special attention to particular soldiers, sailors or airmen, who died near Ypres on the date in question. These men have been chosen because their lives and deaths can tell us something about the terrible conflict in which they were involved - a conflict which shaped the course of the 20th century and which still has an influence on all our lives, even today. With this aim in mind, the personal stories of a number of these men can be found in the glass display case at the entrance to the memorial and also in an exhibition in the Regional Visitors Centre in the Cloth Hall. These stories are stories of mud and blood, of unspeakable suffering and limitless human endurance. However, they are also stories of courage and devotion to duty, of comradeship and self-sacrifice. Gordon Highlanders, who was killed during the aftermath of the British attack at Hooge on 16 June 1915. His entry in the University of Aberdeen Memorial Register describes his death as "the falling of unripe fruit." Robert Patrick Gordon and the soldiers who will be named in subsequent days stand as representatives of all those who fought during the First World War. What they experienced was experienced by all, what they suffered was suffered by all. The only difference was that fate decreed that some must die, whilst others might live. We remember with gratitude their terrible sacrifice. The name of Pat Gordon and other missing Gordon Highlanders. 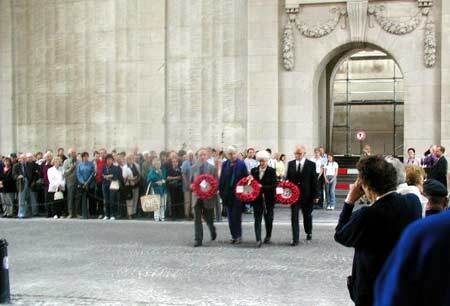 The Gordons and buglers under The Menin Gate Memorial. and making the Gordon family visit to the town such a unique and special occasion.